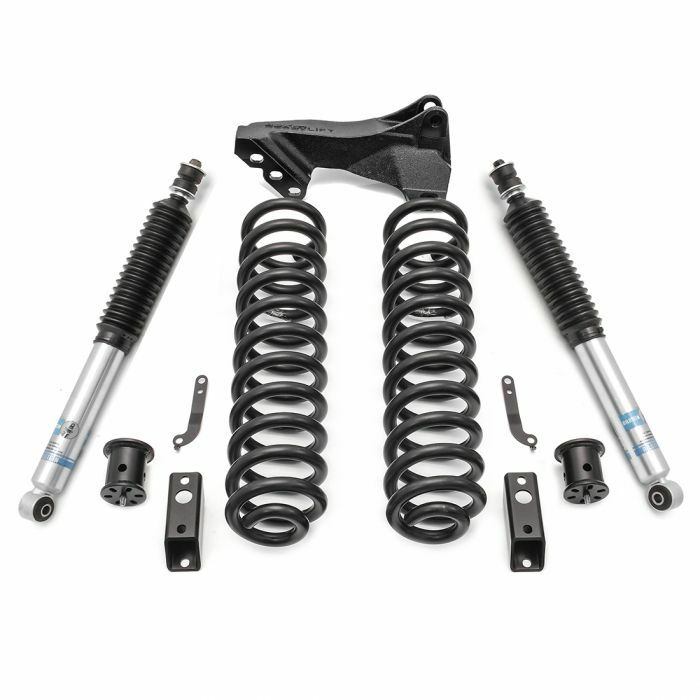 ReadyLIFT Suspension now offers a 2.5" Lift Coil Spring Front leveling Kit made to fit 2011-2018 Ford Super Duty F250/F350 trucks complete with Bilstein 5100 series shocks and our popular front track bar relocation bracket. This gives Super Duty owners an excellent alternative for lifting the front of your truck. 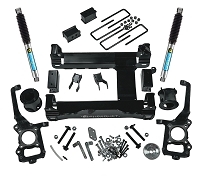 This great new Front leveling system will raise the front of your 2011-2018 4WD Super Duty truck 2.5" while including added value components such as the premiere Bilstein shocks and our track bar relocation bracket.. The 46-2727 coil spring system allows for increased tire sizes and widths along with providing improved ground clearance and a more commanding view of the road. This premiere leveling kit easily allows for 35" tall tires. The 46-2727 coil spring leveling kit delivers a great ride ride and handling performance! 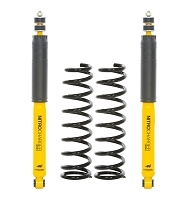 The key ingredients to improving your ride are the new specially engineered coil springs teamed with Bilstein 5100 series shocks and a track bar relocation bracket! This combination is more than just a leveling kit. This is a performance and ride enhancing kit that will really surprise you at how well it rides and performs both on and off road. The ReadyLIFT 2.5" Coil Spring Front leveling kit system for 2011-2018 Ford Super Duty F250 and F350 trucks also included model-specific brake line extension brackets, Our time-tested bump stop extension brackets and new front sway bar frame mount extension brackets to keep the factory sway bar where is supposed to be. If you want tough looks and a smooth but controlled ride, then you want the new 46-2727 Coil Spring Leveling Kit System. Your truck will thank you!